Free Grilling Package Included – $360 Value! Lion Premium Grills will be sending you a free grilling package with your shipment! Buy a Lion Premium Grill today and receive a FREE smoker box, grill cover, rotisserie kit, griddle and griddle remover! 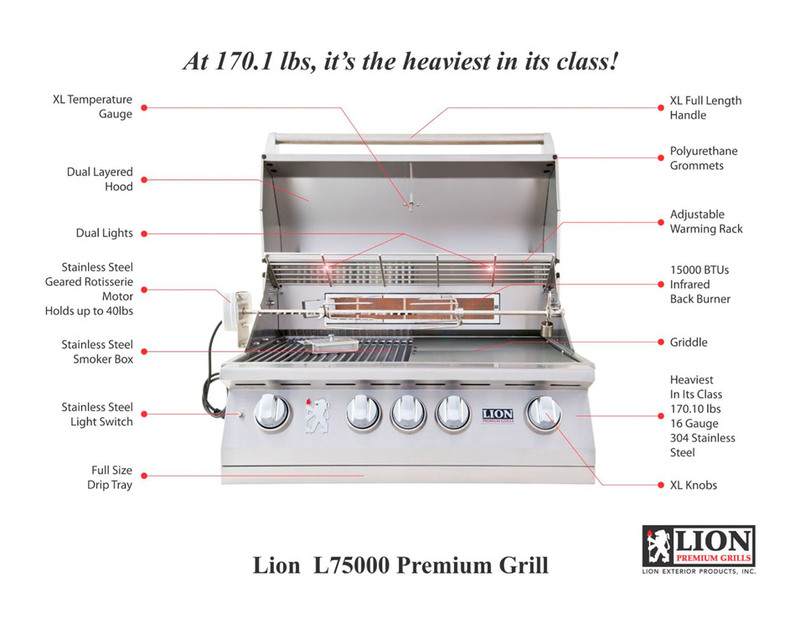 Lion Premium Grills offers 2 luxurious stainless steel gas grills — the L75000 which features 4 burners and the L90000 which showcases 5 total burners — that are crafted from only the highest quality materials. Their premium grills are stacked with a wide range of options and are designed and manufactured by experts to provide the user with the ultimate grilling experience. The Lion 32in. and 40in. Stainless Steel Built-In Natural Gas or Liquid Propane Gas Grills are two of the best outdoor gas grills we offer for a number of reasons. First, the grilling area; the 32in. has 832 square inches of cooking space and the 40in. has and amazing 1,030 square inches of cooking space. The 32in. has four burners and has a total of 60,000 BTUs, (British Thermal Units) of surface heating.The grills have an exterior made of 304, (Commercial Grade) stainless steel. The cooking grids are made of stainless steel as well. There is an optional infrared main burner, although it is not always included. They do come with a rotisserie back burners that put out 15,000 BTUs. These system also include a smoker in the design and a temperature gauge on the outside of the grill lid for easy monitoring. In a Lion Grill San Diego Homeowners have a rugged, powerful and beautiful Barbecue Grill that will last for years to come.